The first tablet with Android on the market has been Motorola with the Xoom. Equipped with Android 3.0 Honeycomb, it should begin to break through the prevailing hitherto dominance of the Apple iPad. As we know nothing came of it and yells something usually for a new trial. The Motorola Xoom 2 Media Edition is such a successor, which for the last week you could for once take a closer look under the microscope. The present me in the Xoom 2 Media Edition (short Xoom 2 ME) comes in a very unique design that is not reminiscent of some of the Razr. With the sloping corners like you can distance themselves from the much-discussed and used by Apple in court design patent and the Motorola has undoubtedly succeeded. The design is very original and proves one thing: You can design a tablet and smartphone unlike the extremely successful templates from Cupertino. Functionally, however, this has no effect, it is only a visual thing. 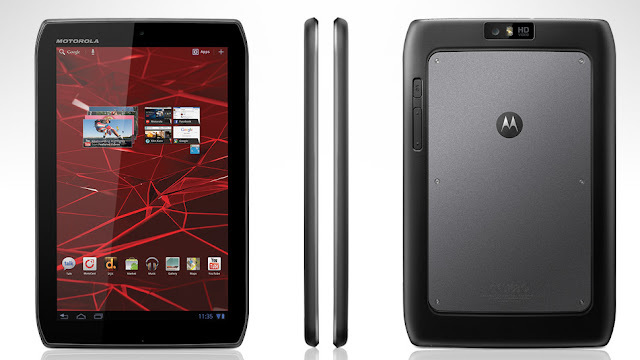 The Xoom 2 ME comes with the usual accessories, therefore, which includes an AC adapter, USB cable and manuals. An HDMI or USB Host Cable seeks to vergeblichst as usual for premium brands, here, manufacturers from China as it goes better . The works of the USB Host I have yet to test, since I for the Galaxy S II, an appropriate adapter cable already can call my own. Interestingly, know the Xoom 2 ME on by House 8 mount points for external USB media. The meaning behind it, I do not really apart from a USB hub. On the other hand, who would join such a tablet. Advertised as a multimedia tablet from Motorola, the Xoom 2 Media Edition is not really convincing, to the speakers to bad for a media player with touchscreen. Video of the performance, however, can not complain much, it is consistently good. Motorola makes it much better contrast with the housing that offers a unique design combined with very good grip with a rubberized surface. To convince also the performance of the device knows in everyday life, the OMAP4430 is well suited for all tasks. Also not understand is using Android 3.2.2, if Android 4.0 Ice Cream Sandwich has been almost half a year. An update to the latest Android version is planned for the third quarter and that's clearly too late. As with smartphones Motorola messes here again in the Software. The flaw would through an open bootloader by the community again can be ironed out, but the bootloader is locked as Motorola usual. The community support could therefore be something coming. Nevertheless rooten, the device, which is designed for hobbyist's a start. Who 10 "tablets are too big or 7" tablet because the resolution is too small, which could with the Xoom 2 Media Edition will be happy. Overall, Motorola offers one premium, lightweight body with a distinctive character for not very expensive at 499 euros retail price for the 3G model with 16GB.